Those who interpret quantum mechanics literally are forced to follow some variant of Everett's relative state formulation (or "many worlds" interpretation). It is generally assumed that this is a rather bizarre result that many physicists (especially cosmologists) have been forced into because of the evidence. I look at the history of philosophy, however, reveals that rationalism has always flirted with this very idea, from Parmenides to Leibniz to modern times. I will survey some of the philosophical history, and show how the so-called paradox of quantum superposition can be considered a consequence of basic rationalist assumptions such as the principle of sufficient reason and the identity of indiscernibles. Ever since Heisenberg and Schrödinger came up with a new foundation for physics in 1925, natural philosophers have been in a tizzy as to what it all means. It is popularly believed that the famous quote by Albert Einstein against the Quantum Theory, "God does not play dice," describes the basic problem: is the universe determined or is there an element of chance in the operation of things? To some, this is the key paradox of Quantum Theory. To others, it is "nonlocality" - apparent faster-than-light effects zipping across the universe instantaneously via a mechanism called "collapse" and in violation of Einstein's Theory of Relativity. To still others, the weirdest thing about Quantum Theory is that it seems to say there is an infinity of other worlds as real as our own. Not everyone is in agreement on what is the weirdest aspect of Quantum Theory, but most seem to agree that it is weird! Most physicists see quantum weirdness as something we have to accept in spite of ourselves, because of the overwhelming empirical evidence in its favour. Richard Feynman argued that we must simply admit that Nature makes no sense - knuckle under and accept the evidence, no matter how weird it seems (Feynman 1985). Yet several hundred years ago Gottfried Wilhelm Leibniz came remarkably close to formulating an early version of Quantum Theory, without the benefit of any of the empirical evidence that aids us today. His Principle of the Identity of Indiscernibles states that no two different objects can have the same description (Leibniz 1991). If "two" objects are indiscernible, with all their properties in common, then there is really only one object after all. This principle has the ring of common sense and is self-evident to many philosophers. Yet as we shall see, the Principle, if taken completely seriously, leads directly to a version of Quantum Theory, complete with all its weirdness. Leibniz only got partway there, but he got much further than hardly anyone gives him credit for. Remarkable for the Seventeenth Century? Indeed, but as far back as the Fifth Century B.C., Parmenides of Elea, the Greek father of metaphysics, came up with much the same idea, although in an even sketchier form. In fact, Leibniz's Principle of the Identity of Indiscernibles is a special case of what I will call Parmenides' Principle, a principle Leibniz rejects, and in so doing undermines his whole system. If Leibniz had heeded the warnings of Father Parmenides and taken his own Principle more seriously, his ideas may have looked even more like modern physics than they already do. Section I gives a brief introduction to the metaphysical problems of quantum mechanics. Sections II, III and IV introduce and discuss Parmenides' and Leibniz's Principles. The goal in Section V is to derive the essential paradox of Quantum Theory from these Principles, so I will avoid delving too much into the precise details of Leibniz's or Parmenides' metaphysics. Still, it will be of some use to briefly discuss both systems, since each is, in its own way, an early precursor to quantum mechanics. Although a full appreciation of the quantum paradoxes requires some rather advanced mathematics, the general ideas can be understood with very little or no math. I will sketch out only the key features, so there is much I will gloss over. Readers wishing a more thorough nonmathematical introduction should see (Davies 1986; Feynman 1985; Herbert 1985). For a more advanced introduction, involving the full mathematical apparatus of quantum mechanics, see (Chester 1987; Mattuck 1976), both of which are excellent. Quantum Theory seems to tell us that an understanding of our world can only be had by developing a theory of all possible worlds. Our world can be said to have structure and order only if it is embedded in a large ensemble of possible worlds. This ensemble is called the "wavefunction" of the universe, and is not definable under the traditional Copenhagen interpretation of Quantum Theory. This interpretation is named after the home of Niels Bohr, its champion. Bohr did not believe in a wavefunction for the entire Universe. He believed that an old-style classical, non-quantum object (such as an observer) was needed to "collapse" the possibilities down from many possible worlds to the one that actually exists. Although most physicists believe there is only one objective world and some kind of "collapse" takes place, there is a significant minority who see the Copenhagen interpretation as an ad hoc and unnecessary addition to the theory. Quantum Theory itself contains no collapse; such a device is not necessary to account for the phenomena we see around us. According to those who hold to the Everett or Many-Worlds interpretation (Everett 1973), the collapse is just a fictitious device we invent whenever we make an observation and thus become aware of which of many possible universes we actually inhabit. Although there are many other interpretations of Quantum Theory, it is this essential issue that runs through them all. Everyone seems to agree that the mathematical equations of the theory are about possibility. But the Copenhagenists believe a collapse mechanism is necessary to ensure there is only one actuality. The Many-Worlders declare that possibility is actuality - there is no meaningful distinction. One of the best examples of the paradox of Quantum Theory is a thought experiment due to Schrödinger and known as the Schrödinger's Cat Experiment. It was known right from the start that quantum mechanics described an ensemble of multiple possible outcomes at the microscopic level. A subatomic particle might, for instance, have a 50% chance of decaying or not within a certain time. The quantum equation describes not just these two possibilities, but as soon as the particle interacts with anything else, the equation also includes all the possible outcomes of the possible interactions, and so on. This means, as Schrödinger recognized, that the problem of multiple outcomes is not restricted to the arcane microscopic level of phenomena, but scales right up to the action of macroscopic things as well. Macroscopic objects are just as much a conglomeration of different possibilities as microscopic objects. To illustrate this, Schrödinger imagined a box that, when closed, completely isolates its contents from the outside world. Inside the box is a cat, a vial of gaseous poison and a mischievous device hooked up to a Geiger counter directed at a sample of radioactive material. This material has, according to quantum mechanics, a 50% chance of decaying during the one minute that it is observed by the device. During that time, if the Geiger counter detects a decay, the device will smash the vial, releasing the poison and killing the poor cat. If, on the other hand, there is no decay, then the device does nothing and the cat lives. If Quantum Theory is literally correct, reasoned Schrödinger, the decay/nondecay event must be considered a "superposition" of both events, since the wavefunction describes both possibilities. But the combined system of the particle plus vial plus cat, etc. is itself just a collection of similar subatomic particles, all of which behave according to the same wave equation. So the quantum wavefunction, after the one minute has elapsed, describes a superposition inside the box of a live cat and a dead cat. Yet when we open the box, we see only one of the two possibilities. What has happened to the other possibility? The quantum equations have nothing built into them to determine which outcome actually occurs. The Copenhagenist says that at some point a "collapse" occurs when the wavefunction interacts with a nonquantum "classical" object. Of course, if large-scale objects are just collections of subatomic particles, then there are no "classical" objects, and hence no collapse. Some have reasoned that, at the very least, we can say that a collapse occurs when we become conscious of the result, leading them to speculate that it is the point of conscious awareness that marks the collapse. To the Many-Worlders, this Copenhagen view of things is an accurate depiction of the world, when described from the (perfectly valid) subjective point of view. But an objective stance reveals a different picture. Subjectively, I experience only one outcome: live cat or dead cat. But objectively, both outcomes occur, and there are two "me"s. One "me" experiences a live cat, and declares that the wavefunction collapsed when he opened the box and saw a live cat. The other "me" declares with equal confidence that the wavefunction collapsed into a dead cat the moment he lifted the lid and became conscious of the lifeless body inside. Both "me"s would be right, from the Many-Worlds point of view, so long as they both realize that, in declaring that their consciousness collapsed the wavefunction, they are only talking subjectively about how reality appears to them, and from an objective point of view, all possibilities are realized. One of the most controversial thought experiments in Quantum Theory is the EPR (Einstein-Podolsky-Rosen) experiment.1 These three great quantum physicists used subatomic particles in their thought experiment, but it also can be talked about as an extension of Schrödinger's Cat; and this version has become popularly known as "Schrödinger's Kittens". Imagine that, instead of one cat, we have two kittens. The kittens are in a box with a single Geiger counter device and a barrier separating Kitten A from Kitten B. The barrier has a hole in it to let the gas pass through. After one minute is up and the device has either killed or spared both kittens, the device automatically closes the hole and detaches the two compartments, so there are now two separate boxes. There is now a superposition, not of a single cat dead/alive, but of two kittens dead/alive in separate boxes. It is crucial to remember that either both kittens are dead, or both are alive. It is not possible that Kitten A is alive and Kitten B is dead, since the hole between compartments was open when the gas was released/not-released. Next, the boxes are accelerated away from each other until they are at opposite ends of the galaxy. John is at one end of the galaxy, awaiting the arrival of his box, while Mary awaits her box at the other end. The superposition now is still (Both-dead/Both-alive), since neither box has been opened. Now, according to plan, John opens his box, but Mary leaves her box closed. What happens? According to the Copenhagen interpretation, when John opens his box, the wave function collapses and he sees one outcome only - assume for now the kittens survive: (Both-dead/Both-alive) ---collapse--> Both-alive. What does this mean for Mary? Is her kitten still in superposition? No! The superposition involved both kittens; therefore when John observes his kitten and collapses the wavefunction, he instantly collapses the wavefunction for Mary's box as well, though Mary has done nothing but sit and wait. This means that John's opening his box collapses the wavefunction throughout the entire galaxy instantly, faster-than-light! This is the phenomenon of faster-than-light correlations, or nonlocality, that has puzzled so many Copenhagenists. Einstein's Theory of Relativity tells us that faster-than-light signalling, or action-at-a-distance, is impossible. So how does Mary's box "know" that John has opened his box and that the result is alive? This is consistent with relativity theory, since there is no way for John to use the merely subjective "collapse" to signal or communicate with Mary faster-than-light, since all along there was a superposition of two disjoint possibilities, each of which obeys relativity perfectly. And just as we would expect, no one has yet found a way to use these apparent faster-than-light effects to signal or communicate faster-than-light. It is puzzling, given this elegant solution to the apparent "nonlocality" problem, that Copenhagenists are still marvelling at the paradox of these faster-than-light effects. The price of the more elegant Many-Worlds interpretation (a price too great for the Copenhagenists) is that we must admit that the superposition describes two worlds, each of which appears to its inhabitants to exist on its own, when in fact the real objective universe is a superposition of both. The wavefunction of the universe has been called a dictionary of possible worlds, where all possibilities are included, within the specified boundaries of the experiment. This last point is important. What if we broadened our point-of-view beyond the two boxes and the kittens? The possibilities included in the equation naturally become much greater. What if we step even further back and take a completely objective point of view outside the entire universe? Since there are no longer any boundaries for our experiment at all, there is a certain logic in assuming that the wavefunction would simply contain all possible conceivable worlds. This is an enormous controversy in physics today. What are the boundary conditions of the universe, if any? If we accept the Many-Worlds view, it seems that there might be none. Stephen Hawking put it this way, quoted in (Barrow 1986 p.444): "There ought to be something very special about the boundary conditions of the universe and what can be more special than that there is no boundary?" No boundary means there is nothing to restrict the dictionary of possible worlds. All possible worlds are equally real from an objective point of view. The appearance of a single world is simply the personal, subjective viewpoint of one conscious entity observing its immediate environment. With this, modern physics has come full circle and is right back where Leibniz was in the Seventeenth Century. Leibniz felt, without the benefit of any of the modern empirical evidence for Quantum Theory, that all possible worlds exist in the mind of God, but that God chooses one to exist over all others: the best of all possible worlds. Leibniz was close to being a Many-Worlder, but he resisted the idea, and opted for a "collapse" to one universe, determined by the will of God. Ultimately, he could not believe that more than one world could really exist. In the coming sections we will see why the philosophical assumptions Leibniz made - in particular the Principle of the Identity of Indiscernibles - lead inexorably to a Many-Worlds view complete with objective superposition and subjective collapse. Leibniz himself was tantalizingly close to formulating a very modern-sounding version of Quantum Theory, complete with Many-Worlds, but with God as the Almighty Collapser of Wavefunctions. The following is my interpretation of Parmenides. Since he wrote in rather obscure verse, his thesis can be viewed from a variety of perspectives, of which mine is only one. For readers interested in an in-depth study of Parmenides, (Parmenides 1984) is an excellent starting point. I will quote from my edition of the poem (Parmenides 1996), an easier to read but slightly less literal version. Parmenides' most important principle, hereafter called "Parmenides' Principle", was that anything rationally conceivable must exist. Nonbeing is not a thing and can neither be thought of nor spoken about in any meaningful or coherent way. Parmenides forbade talking as if there are possible things that nonetheless do not exist. The Unthinkable Way, although not contradictory, is nonetheless not something that can be spoken about or thought of. If no conceivable thing exists, then existence cannot be spoken of at all, and we might as well not continue. There may be no contradiction here, but if "existence" is to be a meaningful concept, there must be at least some conceivable things that exist. The Way of Seeming holds that indeed some conceivable things do exist, but there are others that do not. Parmenides sees this as contradictory, a view held by those "uncritical tribes . . .for whom being and not-being are thought the same and yet not the same . . .for never shall this be proved: that things that are not are." (Parmenides 1996 fragments 6-7) Those who follow this path believe that there exist perfectly conceivable things (things that "are"), such as unicorns perhaps, that nonetheless do not exist (they "are not"). This is contradictory. We say they are, in that they are conceivable structures, yet we say that they are not, since we observe no unicorns in our journeys through life. Parmenides warns you not to "let habit, born from much experience, compel you along this path," which is fundamentally against reason. We say unicorns are not only because they are not part of our immediate experience. Insofar as they can be described, they are, in an objective sense, as much as we. There is nothing conceivable that distinguishes a nonexisting conceivable entity from an existing one. There is nothing descriptive that we can say about the one that distinguishes it from the other. We see now that a corollary to Parmenides' Principle is that there is nothing more to an entity than its structure - a thing is its description, not something that has the description. So while Parmenides says that the Way of Seeming is contradictory, it can be made consistent by rejecting his Principle and simply declaring that there is something underneath an entity apart from its descriptive structure, what some call the "bare particular" (a particular thing bare of all structural properties) - e.g., (Long 1970). However, we will go along with Parmenides in assuming that this makes no sense, since the nature of the bare particular is not something describable. Parmenides admits that, from a subjective point of view, it appears that some things exist and other things do not. But this is just a subjective illusion. The truth, apart from our particular view on it, is that all possibilities are equally real. This leads Parmenides to the conclusion that the whole of existence is a single, continuous, undivided and unchanging unity: the "One." If it seems strange that taking all possibilities as real leads to a single indivisible and undifferentiated substance, consider the following analogy. Assume that we have a block of marble from which a sculptor is about to carve a statue. This block of marble is, for the purposes of this analogy, everything that can clearly and distinctly be thought about or spoken of (i.e., it contains all possible sculptures). To get any particular sculpture, a sculptor need only remove the bits that are not part of what she has in mind. Once some bits are removed, there is no going back - some possible sculptures are now eliminated from the marble forever. But if all possible sculptures are included, no bits can be removed and the block remains continuous, undifferentiated and unchanging. Taking the block of marble to be reality, most of us certainly consider it to be differentiated, but only because we are part of the marble, so we see some of it as outside us and some of it as part of us. From the viewpoint of the external sculptor, the marble is, in Parmenides' words, "full" everywhere - a plenum of what-is. This idea of a plenum of all possibility, which is simultaneously the simplest thing and yet that from which all things complex can be generated, plays an important role for all the Seventeenth Century Rationalists. As such, Parmenides was the Ancient father of the modern Rationalism championed by Descartes, Spinoza and Leibniz. Leibniz, especially, holds a view that owes much to Parmenides. Yet, as we shall see, Leibniz could not bring himself to accept Parmenides' Principle, and his entire system suffers as a result. A foundational principle of utmost importance in Leibniz's metaphysics is the Principle of Sufficient Reason. This principle is taken by Leibniz as a given. It states simply that there must be a sufficient reason things are one way rather than another (Leibniz 1991 sec.32). Within the realm of what Leibniz calls "necessary truths", the Principle of Sufficient Reason is equivalent to the Principle of Contradiction, which states that a proposition is necessarily true if its negation entails a contradiction. Thus, the Principle of Contradiction allows as possible truths all self-consistent entities. 'A unicorn with a single horn and a limp' is allowed as a possibility so long as a self-consistent (noncontradictory) description of such a beast can be made (and it seems likely that such a description could in principle be worked out). Does this mean that Leibniz agrees with Parmenides, that an entity's description is all there is to it? No. Within Leibniz's system, so long as we stick to Necessity, things are quite Parmenidean: all conceivable things are allowed. But Leibniz realized that not all self-consistent things are compatible with all other self-consistent things. For Leibniz, this meant that, if we were to build a dictionary of possible things, we could partition the resulting things into categories of "compossible" things, each partition containing compatible possibilities. Any two self-consistent things that are incompatible with each other are put into separate partitions. For instance, a world in which Schrödinger's Cat survives is incompatible with a world in which it dies, so these two possible things are partitioned into two disjoint and noninteracting "possible worlds". Here we have Leibniz's rejection of Parmenides' Principle. There can only be one really existing world. He gives no justification for this; it would appear that he just considered it obvious there could only be one. But in declaring that one possibility exists and the others do not, he is embarking on Parmenides' Way of Seeming and rejecting the Way of Truth. All is not Necessity for Leibniz. Our universe is distinguished from the ones existing merely "in the ideas of God" by something I can only call "really existing". This is a completely nondescriptive property (and as such is hardly a property at all). If you wish to give it a little more oomph, you could call it "really truly actually existing," but it is all one to me. Sufficient Reason seems to insist on Parmenides' Principle, yet Leibniz accepts the former and rejects the latter, justifying it with the "choice of God." To save Sufficient Reason, Leibniz invokes a new principle, the Principle of Perfection. While the Principle of Contradiction is the sufficient reason for necessary truths, contingent truths (all dependent on which possible world is real) have as their sufficient reason the Principle of Perfection, which states that God always chooses the best. Personally, I find this a very nebulous, ad hoc and ill-defined notion, and in conflict with the Principle of Sufficient Reason. From here on, I will assume that Parmenides' Principle follows from the Principle of Sufficient Reason, the only valid form of which is the Principle of Contradiction. This seems tantalizingly close to the corollary to Parmenides' Principle that we saw earlier: that a thing is only its description and there is no bare particular. But, as we have seen, Leibniz did not ascribe to this, although his Principle of the Identity of Indiscernibles does seem to almost equate the thing with its structure. Why else would we assume that two things with identical structure necessarily must be one thing? If there is a bare particular, the featureless thing that has the structure, then why could there not be two different structurally identical things? Yet in Leibniz's system, because he introduces contingency through God's choice, there is something to an entity besides its structure: its existence due to God. Again, I believe Leibniz is in trouble with this. There seems little justification for the Identity of Indiscernibles without something like Parmenides' Principle to back it up. In fact, the three Twentieth Century authors we will look at next discuss the Principle of the Identity of Indiscernibles as if it does include something like Parmenides' Principle. From here on, I will assume that the two principles go hand-in-hand. O'Connor (1970 p.272) complains that the two things Rescher above calls thing-#1 and thing-#2 are distinguished automatically because thing-#1 is not-thing-#2 and thing-#2 is not-thing-#1. Immediately, we see that the two things differ by at least this property - the property of identity. O'Connor tries to maintain the Principle by eliminating identity as a "property", but he sees a problem: where is this to end? Are there still other properties that must be so labelled? It seems we are declaring any property that disagrees with the Principle to be a non-property, making the Principle meaningless. Ayer (1970 p.266) correctly sees that O'Connor is barking up the wrong tree by focussing on the identity property. The problem is that 'thing-#1' and 'thing-#2' are not really properties in the first place, since 'thing-#1' and 'thing-#2' are simply labels, or names. They are not descriptive, and are not intended to be taken as part of the entity (thing-#1 does not have "thing-#1" stamped on its side in red). So we have a rule for applying the Principle: only properties that are descriptive, involving no arbitrary naming, are true properties. O'Connor brings other properties into the picture, such as space-time coordinates (O'Connor 1970 p.274-5). What if there are two baseball bats before us, and they are absolutely identical, except that they are in different locations in space? O'Connor suggests excluding as true properties any that cannot in principle be applied to more than one thing (such as location within an absolute space-time coordinate system). Again, this is better seen as an application of Ayer's rule. If a property cannot in principle be applied to more than one thing, then it is not descriptive; it does not describe structure. Properties are generalizations - instantiations of universals - they describe structure. If something has the property 'red' (it is an instantiation of the universal 'red'), this means that 'red' could at least potentially be applied to other things. If, by its very definition, 'red' applies only to that one object, then it cannot be descriptive of that object; it is a mere name. Since a location in absolute space-time coordinates says nothing about the object itself, it is just an arbitrary nondescriptive naming. Again, Ayer's principle of excluding names solves the problem. O'Connor extends the example further by suggesting there are possible universes where two different things can be in the same place at the same time. Here, absolute space-time coordinates are no longer necessarily unique and can be admitted as properties. But Ayer's rule again solves the apparent problem; absolute space-time coordinates are still arbitrary labels and nondescriptive, even if we declare that one label can apply to more than one thing. It is whether the label is part of the thing described that determines its status as a property, not whether it can be applied to more than one thing (although it is true that a truly descriptive property would have to be potentially applicable to more than one thing, it does not follow that any label potentially applicable to more than one thing must necessarily be descriptive). But what about relative coordinates? Surely the two baseball bats have different spatial relationships with the other objects in the universe. This set of interrelationships defines an effective coordinate system - a relative one that is structural and not an arbitrary labelling. Does this make the two bats different? In a way, yes, but not really. The property in which they supposedly differ is relational and involves not the internal description of the bats, but the relationship of the bats with other external objects. Instead of saying there are two bats, we could say the bats are internally identical, but not identical with respect to their relationships to other objects. But then there are two bats only if we include these relations as part of the bat. But if we do this, we have to include the entire rest of the universe and its relationships with the bat as part of the bat. Leibniz actually does something much like this, although we do not have the space to explore his particular system here. I will proceed on the basis that when I talk about one object out of a universe of objects, I am intentionally divorcing that object from its context, and talking about it as if it were not in that universe at all (what Spinoza would call a "finite mode" of the one substance (Spinoza 1992)). Without doing something like this, we really cannot talk about individual objects within a universe in the first place. Remember that the Principle of the Identity of Indiscernibles is properly treated as a corollary to Parmenides' Principle. The two identical baseball bats are not identical structures when considered in context with all other objects. However, if considered on their own, they have the same structure, and it is this structure that is one and not two (but this structure is really the only thing that can be called a baseball bat without bringing in the entire rest of the universe). So I choose to say that there is one bat and not two. Yet if the one bat is truly one, when considered in context it must have all the relations we formerly attributed to each bat independently. This includes the spatial relationship between the two bats, which now becomes a spatial relationship of the one bat with itself! This is very much like an example put forward by Black (1970), where he imagines a possible universe where there are nothing but two perfectly identical spheres. The difference is that with the spheres, there are no relations with other objects to confuse the issue. It seems intuitive to some people that without these extraneous relations, the two spheres must have identical descriptions and yet really be two. The description of each sphere's relationship to the other sphere is identical, yet this relationship would not be a property of a single sphere existing by itself, since there would be no other sphere for it to have a spatial relationship with in the first place. But this does not mean that there are two spheres. 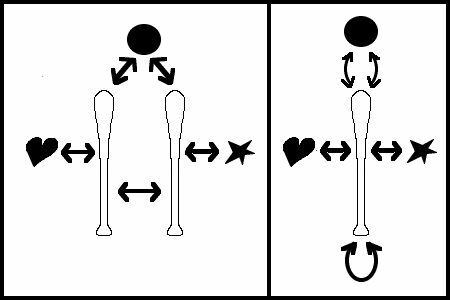 A single object can have a relationship with itself, which is what we did with the baseball bats (see the diagram). This becomes an internal relationship, and should not be called an external relationship just because, in our thought experiment, it is the sort of relation we usually apply to two objects instead of one. So the universe with only two spheres could equally well be described as a single sphere with an internal spatial relationship to itself. If this seems too bizarre to picture, keep in mind that this is a bizarre universe you are imagining, and your current physical intuitions do not necessarily apply. The key point is this: the universe can logically be described as two spheres, but a description based on one sphere is simpler. It should be obvious by now that the Identity of Indiscernibles requires something like Occam's Razor3 to justify preferring the simpler description. The two-sphere description is unnecessarily complicated, though logically consistent. According to Ayer, Leibniz himself did not deny the logical possibility of describing indiscernibles as more than one (Ayer 1970 p.263), but if the simplest description has only one sphere, what do we gain by claiming there are two? Of course, there are people who believe in bare particulars, counter to Parmenides' Principle. Such a belief would allow the two spheres to be two, completely independently of any structural considerations. But we have already decided to go with Parmenides in dismissing this as incoherent. Black extends his two-sphere universe to include more than spheres. He imagines two Earths, with people living out their lives, each Earth perfectly mirroring whatever happens on the other. Again, if we take Parmenides' Principle seriously, the simplest possible description of such a universe would include only one copy of the Earth's structure, not two. So what sense is there in saying there are two Earths? Even if the people on Earth-#1 could see or interact somehow with those on Earth-#2, so long as the interaction is symmetrical, we can just as easily consider it to be a relation the Earth has with itself, rather than with another identical Earth. This makes it an internal property and not a relation at all. A simple rule is emerging here. To decide if there are two objects or one, write out the shortest description you can of the possible universe under consideration. Is the structure (or structures) in question described only once or more than once in the result? If once, then you have only one object. So the opponents of the Identity of Indiscernibles are not inconsistent, they are simply violating Occam's razor in not preferring the simpler explanation. Path #3 (the Way of Seeming) likewise is not really inconsistent. It simply adds ad hoc, unnecessary entities to the system. I can say that this is real, that is not (although they are both describable). I can say that this is really 'A', that is really 'B' (although they are both identically describable). But both statements violate Occam's razor by adding a nonstructural unnecessary property to a describable thing. In the former case, the ad hoc really-existing "property" is the culprit. In the latter, the ad hoc A-ness and B-ness "properties" (really just arbitrary labels) are to blame. So just as Ayer taught us to eliminate labels, we also should eliminate all unnecessary ad hoc entities that have nothing to do with structure or form. The bare particular is a prime culprit here. What does this fictitious, if logically consistent, "property" add to our understanding of an object? Nothing. It is there simply as a metaphysical pacifier to sooth us into believing that, in Parmenides' words, "things that are not are." The Principle of the Identity of Indiscernibles, then, is an application of Parmenides' more general Principle that all-there-is is form (that which is there for speaking and thinking of). The Principle implies that no two different objects can be the same structurally - for if there is nothing but structure and they are structurally the same, then they are the same object. All there is to an object is its form; there is no bare particular. Unfortunately, relatively few philosophers have taken Parmenides seriously. The history of metaphysics is a long line of metaphysicians justifying their reasons for following Path #3. Leibniz goes a good solid piece towards accepting Parmenides' Principle, but ditches out in the end. Probably the number one reason so many reject the Principle is that it inevitably leads to something like Parmenides' plenum and the conclusion that all possibilities exist. As Leibniz realized, this means there must be more than one disjoint universe, which he thought absurd. But modern physics, through the Many-Worlds interpretation, gives us good reason to seriously examine this possibility. So if we accept the Principle of Sufficient Reason, we also must accept Parmenides' Principle and the Identity of Indiscernibles; we are forced to reject bare particulars and to conclude that all possible worlds are, in an objective sense, equally existent. For what sufficient reason could there possibly be for one possible thing to be and another not? In other words, the two worlds have an overlap in structure. Like the "two" baseball bats, which it seemed so counterintuitive to count as one, and like the "two" spheres, U1(t0..ti) and U2(t0..ti) are not two objects, but just one (the fact that we have different arbitrary labels is, as Ayer told us, irrelevant). But U1(ti+1...) and U2(ti+1...) are as distinct as any two different universes can be. So U1 and U2 should properly be considered to start out as a single universe, call it U, that splits at time ti+1 into two universes. This is exactly the situation in the Many-Worlds interpretation of Quantum Theory. Now consider the simple question "What am I?" If Parmenides' Principle holds, then I am just my form or structure. But what is this form to begin with? If we follow Leibniz's rationalist predecessor, Descartes, with "Cogito ergo sum" - "I think therefore I am" - then I am nothing but my thoughts, nothing but a thinking thing (Descartes 1993 Med.1-2). But what if this thought-structure (my current mind-state) exists in more than one possible world? What if U1(t0..ti) and U2(t0..ti) are identical descriptions of my mind state from birth until now, but U1(ti+1...) unfolds into my becoming a street bum and in U2(ti+1...) I win a Nobel prize? It seems that I split into two copies of myself, from an objective point of view. From a subjective point of view, each copy thinks it is the only one, and sees randomness in what is really completely determined and necessary. "Why," asks one copy, "did I become a street bum when the laws of physics said I had an equal chance at a Nobel prize? Ahhh . . .God plays dice." What if the two universes before time ti+1 are distinguishable, but contain identical copies of me, my current thought-structure? We must do what we did for the spheres and baseball bats: declare that piece of each universe that corresponds to my mind as one and the same object. The rest of the universe then becomes a "superposition" of different possibilities. So my universe U is defined as my thought-structure and all that determines it. Anything that could possibly be different without affecting my thought-structure is not part of U, or more correctly, these different possibilities are all part of U as a superposition. When the different possibilities come to affect my thought-structure in different ways, I am at time ti+1 and an apparent split of the entire universe occurs. But, as we have seen, I could just as well say there were two universes all along, with some structural overlap, which just happened to be me. So why does the world seem so orderly and tidy if the world where your hand turns into purple cabbage is just as real as the one where it does not? It may be useful to ask yourself why you would be surprised if your hand turned into purple cabbage in the first place. Any quantum physicist will tell you there is a finite probability of any kind of weirdness happening. But most of the possibilities, while structurally distinct, seem pretty much the same to us - the differences, while real, are boring and we ignore them. Which world you end up in is a purely random crap-shoot, since one version of you ends up in all of them. It is like a lottery. Are we surprised when the winning lottery number is 666666666? Of course. But when a number like 183580348 wins, we think it quite mundane. Strictly speaking, both numbers are equally likely, but 666666666 seems special to us - we are giving it special significance. But that is just a subjective judgement; objectively speaking, there is a sense in which we should not be any more surprised at one result than the other. Your hand turning into cabbage is like the number 666666666 in the lottery. The mundane, orderly, "lawlike" stuff that actually just happened to your hand was strictly speaking as likely as your hand turning into cabbage, so from a purely objective viewpoint, you should be no more surprised by one than the other. But there were many many more states that you also would have found perfectly mundane. So they all get lumped into "lawlike" and thought of as "pretty much the same." A central doctrine of probability theory is that probabilities always require a point-of-view; they are subjective and due to the grouping of things into similarity classes. In this case, the purple cabbage world gets lumped into "bizarre" and the mundane lawlike worlds get grouped into "lawful". These are arbitrarily defined universals. The particular individual worlds all have equal status from an objective standpoint. We see more Lawful worlds than bizarre ones only because we have grouped things in this manner. Is all this really the way standard quantum mechanics works? Are the more probable worlds in the above system the ones we really see? To answer that would involve a mathematical analysis of Quantum Theory and even then, my conclusions are admittedly controversial. Still, the essential paradoxes and problems of Quantum Theory are found in the above system, which can be entirely reasoned out from an uncompromising application of Parmenides' Principle and the Identity of Indiscernibles. This was a step that Leibniz was not prepared to take. Parmenides, on the other hand, was just as uncompromising as we have been, although certainly less sophisticated. In fact, he came up with something much like the Many-Worlds interpretation, millennia ago, through the application of pure reason alone. Why believe in a plurality of worlds? - Because the hypothesis is serviceable, and that is a reason to think that it is true. The familiar analysis of necessity as truth in all possible worlds was only the beginning. In the last two decades philosophers have offered a great many more analyses that make reference to possible worlds, or to possible individuals that inhabit possible worlds. I find that record most impressive. I think that it is clear that talk of possibilia has clarified questions in many parts of the philosophy of logic, of mind, of language, and of science - not to mention metaphysics itself. Even those who officially scoff often cannot resist the temptation to help themselves unabashedly to this useful way of speaking. Father Parmenides warned us not to falter and take the forbidden Way of Seeming. Do not believe, he tells us, that appearances are any more real than all the other conceivable things. There is no rational basis on which to distinguish a really objectively existing conceivable thing from a really objectively nonexisting conceivable thing. There is nothing structural to distinguish them, one as existing and the other as not; therefore the distinction is meaningless. Yet the history of metaphysics is riddled with metaphysicians who reject the Principle. The Principle seems inherent in Leibniz's Principle of the Identity of Indiscernibles. Yet Leibniz rejects Parmenides' Principle, introducing the will of God to make one conceivable thing exist and the others not. As we have seen, in so doing, he undermines his own Principle of Sufficient Reason, and hence the Principle of the Identity of Indiscernibles as well. Even today, with the same metaphysical problems cropping up in Quantum Theory, it is a minority of physicists (although perhaps a majority of cosmologists) who accept the Many-Worlds view. Most, like Leibniz, reject Parmenides' Principle and assume that there are conceivable things that "are" and conceivable things that "are not", but not by virtue of anything about them that is conceivable. Some may argue that there are things conceivable apart from what can logically and rationally be described; but this is a kind of mysticism that is hard to answer. Until I experience such a direct grasping of nonstructural properties, I will stick to rationality. Parmenides, the true father of Rationalism, stands with very few others in his fight against the "uncritical tribes" swarming down Path #3. At the end of the Twentieth Century, we might do well to listen to the father of metaphysics. In so doing, we may be better equipped to treat the universe as a rational place, and all those intractable quantum paradoxes of the past seventy years might just dissolve into sheer Necessity. 1For Niels Bohr and Albert Einstein, it was just a thought experiment, and they argued over it for years - with Bohr defending the predictions of Quantum Theory. But in 1982, Alain Aspect performed the experiment for real in a laboratory and verified the strange behaviour of quantum reality. 2At the very least, the gravitational forces from other objects would create internal differences within the two bats. Even a lead box cannot keep out gravity. For similar reasons, we could never in practise actually perform a true Schrödinger's Cat Experiment. At least not with a cat - it is possible to perform such experiments with subatomic particles, since they are simple enough in structure that it is possible in practise to isolate one from the rest of the universe. Hence, it is possible for an electron to be truly indiscernible from another electron in the way our fictitious baseball bats are. In fact, modern physicists are almost unanimous in declaring the indiscernibility of electrons. It is popular in physics circles to quip that, for all we know, there is really only one electron in the universe! By my reasoning, this is exactly correct. Of course, since an electron has no internal structure at all (it is an infinitely small point), its existence in this world is really more a matter of its relationships with other objects than any internal structure. Unlike a baseball bat, an electron is not very interesting when divorced from its context. 3Occam's razor is named after William of Occam and tells us we should prefer the simpler explanation over the more complex one. Most philosophers and scientists agree with the basic point, but there is disagreement over the definition of "simple" and whether simplicity is an objective feature of an explanation, or merely subjective. Most agree, though, that it is the simplicity of the initial starting assumptions or first principles of a theory that matters, not the simplicity of the resulting entities derived from those principles. 4This is why quantum mechanics needs an infinitely-dimensioned space-time (or Hilbert space) to describe the superpositioned universe (as opposed to the classical universe, with only three spatial dimensions and one of time). Think of it: every second you may be differentiating into an infinite number of different versions of yourself. Ayer, A.J. "The identity of indiscernibles," In: Universals and Particulars: readings in ontology, M.J. Loux (Ed. ), pp. 263-270. U. of Notre Dame Press, Notre Dame, 1954, 1970. Barrow, John D. and Frank J. Tipler. The Anthropic Cosmological Principle. Oxford U. Press, Oxford, 1986. Black, Max. "The identity of indiscernibles," In: Universals and Particulars: readings in ontology, M.J. Loux (Ed. ), pp. 250-262. U. of Notre Dame Press, Notre Dame, 1952, 1970. Chester, M. Primer of Quantum Mechanics. John Wiley & Sons, New York, 1987. Davies, P.C.W. and J.R. Brown. The Ghost In The Atom. Cambridge University Press, Cambridge, UK, 1986. Descartes, René. Discourse on Method and Meditations on First Philosophy (3rd. Ed. ), Donald A. Cress (Trans.). Hackett, Indianapolis, 1637, 1641, 1993. Everett, H., III. "'Relative state' formulation of quantum mechanics," In: The Many Worlds Interpretation of Quantum Mechanics, DeWitt & Graham (Eds. ), pp. 141-149. Princeton U. Press, Princeton, 1957, 1973. Feynman, Richard P. QED: the strange theory of light and matter. Princeton U. Press, Princeton, 1985. Herbert, N. Quantum Reality. Anchor Press/Doubleday, Garden City, New York, 1985. Hughes, R.I.G. The Structure and Interpretation of Quantum Mechanics. Harvard U. Press, Cambridge, 1989. Leibniz, Gottfried Wilhelm. G.W. Leibniz's Monadology: an edition for students, Nicholas Rescher (Trans.). U. of Pittsburgh Press, Pittsburgh, 1720, 1991. Lewis, David. On the Plurality of Worlds. Blackwell, Oxford, 1986. Long, Douglas C. "Particulars and their qualities," In: Universals and Particulars: readings in ontology, M.J. Loux (Ed. ), pp. 310-330. U. of Notre Dame Press, Notre Dame, 1968, 1970. Mattuck, Richard D. A Guide to Feynman Diagrams in the Many-Body Problem (2nd. Ed.). Dover Publications, New York, 1976. O'Connor, D.J. "The identity of indiscernibles," In: Universals and Particulars: readings in ontology, M.J. Loux (Ed. ), pp. 271-280. U. of Notre Dame Press, Notre Dame, 1954, 1970. Parmenides. Parmenides of Elea: fragments, David Gallop (Trans.). U. of Toronto Press, Toronto, c. 475 BC, 1984. Parmenides. On Nature, Allan F. Randall (Ed.). http://www.allanrandall.ca/Parmenides/, Toronto, c. 475 BC, 1996. Rescher, Nicholas. Leibniz: an introduction to his philosophy. Rowman and Littlefield, Totowa, New Jersey, 1979. Spinoza, Baruch. The Ethics. Treatise on the Emendation of the Intellect. Selected Letters, Samuel Shirley (Trans.). Hackett, Indianapolis, 1677, 1992.